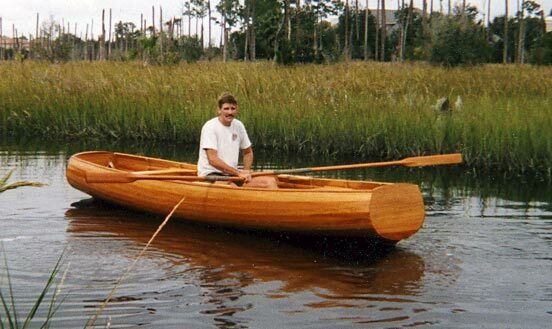 John Horst writes "I designed and built (actually just built) this 16' x 4' boat for rowing and fishing on Cabbage Creek and the ICW in Ponte Vedra, FL." He used 5/16" cypress planking over resorcinol-laminated ash frames. The cove and bead edges on the planks are glued with polyurethane construction glue and stapled to the frames. He shaped the bow with Styrofoam and fiberglass. It took him about 100 hours to build and he completed in April 2001.